WHY are TV producers turning to religion? The answer is not far to seek. India has over 30 million gods and goddesses of which at least 100 cut across language barriers. Because of the captive viewership, there’s a veritable rush of epics on the small screen. Just look at the growing list... Jap Tap Vrat and Ma Shakti on Star Plus. Draupadi and Om Namah Narayan on Sahara. A re-run of Mahabharat on Sony which also airs Sri Ganesh and Sri Krishna. 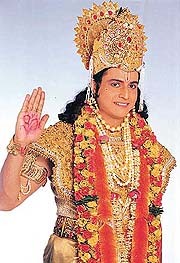 There’s Vishnu Puran on DD Jai Ganesh on Zee and animated version of Pandavas on Cartoon Network. The latest to join the mythological wagon is Om Namah Narayan on Sahara TV. According to its maker, Dheeraj Kumar, the serial is different in the sense that it shows all the 24 avatars of Lord Vishnu whereas most others have limited themselves to only 10. The serial begins with Lord Vishnu in Kalyug ka avatar contemplating the world’s destruction to rid it of devils and evil. "This is a costly serial," says Kumar. "The special effects we’re using are on a par with the best and include virtual reality, 3-D tracking and light wave." Most media observers agree that the costs involved in making mythologicals in these competitive times are phenomenal. Still, wannabe producers keep cropping up. They know it isn’t always that the success of Mahabharat can be replicated. But, as Lord Krishna says in Sri Krishna," Hope reigns supreme in a man’s heart." Music is the soul of India, there is a song for every occasion, every mood and every celebration. It transcends languages and barriers and binds the whole country together in one single string which touches the heart directly. Zee TV’s latest offering Ek Tukda Chaand Ka being telecast every Monday to Friday at 8 p.m. explores the musical facet of Indian life. It revolves around a simple small town girl who follows her lover into the city but is ditched by him. She decides to settle down in the city and in a short span of time becomes a glamorous and successful woman who goes through a series of emotional relationships and break-ups. Produced by Tony and Diya Singh for Cinevista Communications the serial has been extensively shot at exotic locales to give it that unique romantic touch. Devoid of any big stars, or any original concept, the high point of the serial is its music which is a real treat for the ears. Sony Entertainment Television has a very different kind of entertainment in mind. The channel is all set to telecast the best episodes of its ever-popular horror show Aahat which over the years has built up a big following because its spine-chilling storylines and heart-stopping special effects. Dahshat ke 6 Saal, from Monday to Thursday at 10.10 p.m. is out to spook you the old-fashioned way. In an all-new format, each story will wind up in one episode and a new one will be waiting to blow your mind the following day. Over the past six years, Aahat has narrated tales of inexplicable happenings, murders and mysteries that defy logic. The common thread running in all the stories is the element of horror and how ordinary situations can turn into terrifying nightmares. So, get ready for those screams in the dead of night that will send a shiver down your spine. Definitely not recommended for the weak-hearted. If you found the movie funny, you are going to love this serial. Based on the immensely successful comedy, Honey I Shrunk The Kids, a 65-episode mini series by the same name is out to regale you every Sunday at 11 a.m. on Sony Entertainment Television. 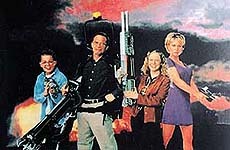 The series is an appealing combination of comedy, science fiction and family drama. Each episode incorporates new technologies and digital effects and is backed by a smart script and some excellent performances — an exhilarating experience for the whole family. The popular TV series unfolds the uncanny adventures of the Szalinski family whose members turn into miniscule dwarfs after a bizarre scientific experiment goes haywire. Transformed into miniatures, the family members find even the most ordinary tasks daunting. They are faced with interesting situations providing the viewer a gripping drama laced with alien encounters, machines with emotions, molecular configuration, genetic mutation, cloning, space and time travel. This series, adjudged as more entertainment than cartoons, is an excellent way to put children — and adults — in the mood for the festive season. He might have lost out to KBC in Sawal Dus Crore Ka. But when it comes to kids, Anupam Kher wants to prove he’s no less than Amitabh Bachchan. If the Big B is having a dream run with Junior KBC, Kher too is living it up with kids on the small screen. Say Na Something To Anupam Uncle every Friday at 8 p.m. on Sab TV is perhaps the first show of its kind that only has children as invited guests. A show meant purely for kids, it gives them a chance to express their views on anything that want to talk about. And Anupam Kher is there listening and advising. When not on TV, Kher goes looking for kids. Recently the show had a tie-up with McDonalds where some lucky kids got a chance to participate in the show. All they had to do was to fill a coupon telling their little secret to the star. 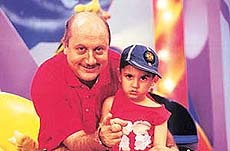 After his debacle with Zee TV, Kher is doing his utmost to make a success of Say Na Something to Anupam Uncle. And the efforts are showing. The show offers an opportunity to grown ups to peep into the innocent world of children where dinosaurs walk, parents are unquestionably loved, film stars are heroes and politicians are aliens from some other planet! Whales, elephants, gorillas and tigers — each of these animals is extremely different, yet they all have formed distinct relationships with humans. 21st Century Ark every Saturday at 9.00 p.m. on Animal Planet profiles endangered species from around the world and studies their relationship — whether harmful or beneficial — with humans. From spotted cats to giant apes, each episode focuses on a different species. It highlights one endangered animal and examines its recent history, explaining how it became threatened and what has been done to reverse its decline. 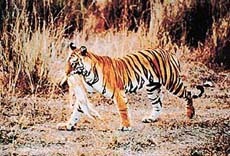 Naturalists and wildlife experts provide background information and opinions. By concentrating on the daily life of the animal in question and examining the myths and legends that bind them to humankind, the programme aims to raise awareness of the very real possibility that these creatures face extinction if humans don’t work to save them. The series teaches viewers that everything humans do, even the clothes they wear, can affect animals. A crisp script and some rare footage of endangered species makes this an absorbing series.